What Are You Simplifying For? Recently when I spoke at the HEAV convention in Virginia, I talked about my heart and simplifying homeschool. I noticed many people came thinking they would hear all of the practical ways to make homeschooling easier or more efficient and more organized. While that is true, and those things are a practical part of simplifying, I think they were pleasantly reminded that those are just a small part of what simplifying is really about. Focusing on heart issues and getting back to the basics of WHY we homeschool so that we can focus on God, is the true purpose for me in simplifying. He is the reason we are doing this and He is the focus. The same thing really applies to all areas of simplifying. Simply Living…for Him is really about simplifying all areas of our life so that we can keep our eyes fixed on God and not get distracted by all this world has to offer. All this world has to offer ends someday, yet what He offers us is eternal. So what are you simplifying for? 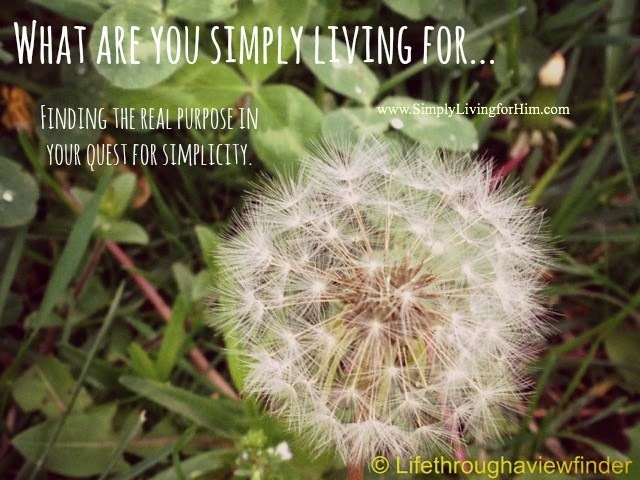 What are you simply living for? Is it for Him? Or does it take you right back to the world? Are you eliminating clutter to make life easier or more efficient? Those things are the result of simplifying but not necessarily the reason behind it. Simple living is about so much more than just eliminating clutter. It is going back to the heart. The world’s voice is constantly calling and often it is louder than Jesus. May His voice always be louder. Evaluate your time. Are you eliminating activity so you have more time for Him? For the Word? Or do you just end up filling up your schedule right back again with new activities? Are you simplifying clutter, but not focusing on storing treasure in heaven? Because if you are, then you will end up filling your home once again with worldly treasure that doesn’t last. If the heart is not filled, you will continue the vicious cycle of filling up again and again on things that don’t matter. We can talk all we want about wanting to do the right things, but are we actually doing it? Truth be told, it is a battle sometimes for me in the morning, when I rise with the sun and the birds are chirping and I want to stay in bed awhile longer, or open up my email first thing. I have to remind myself I must spend time with my Creator before anything. I must seek Him first in my day. Or I battle with myself when I clean out a room only to be lured at the store into filling it up again with some shiny new gadgets. The promise of happiness in a “thing.” Only to end up disappointed down the road. Or when I feel like my homeschool curriculum is set, but then walk the halls of a convention and start to fill up on new material (that I don’t really need.) It is the cycle of purging and filling up again. We must be on guard. Simplifying is really not simple. It is at its core a heart issue. A soul issue. An issue to deal with. So ask yourself today, what are you simplifying for? I write about this topic and more in my new eBook. Have Less Fluff in Your homeschool…and Bear More Fruit! Focus on the important things!